The world is changing - and that means the complex role of a leader is changing too. One of the biggest changes - and challenges that many leaders and organizations are facing is leading teams remotely. Leading remote employees is now a fact of life. Over 80% of teams and 90% of projects have at least one member not physically located with the rest of the group. And a recent study from GlobalWorkplaceanalytics.com showed that the number of employees who telecommute more than one day per week increased over 79% from 2005 to 2012. These facts, while compelling, only matter if you are someone leading others remotely. If you or others in your organization do, you owe it to yourself, your team and your organization to read on. While the principles of effective leadership and team management haven’t changed, maintaining peak performance and keeping employees engaged when separated by miles, time zones and culture is a tall task for any manager or organization. Let’s be honest – leadership of others is already hard enough when they are down the hall or on the shop floor. When you add in the challenges of them being remote, it gets harder – and more stressful. How do we build the relationships and trust with the team – and help them do that between each other? How do we deal with the unknowns? After all, we can’t see what they are doing, how they are doing it and if they are ever working? If you have ever struggled with even one of these questions, you know what we mean. Leadership is hard ... doing it remotely is even harder. But it is part of our job. From communication...to performance management...to motivation...and more, as a remote leader, you’ve got to be prepared to stay connected, handle meetings and schedules and provide the support your staff expects and needs. 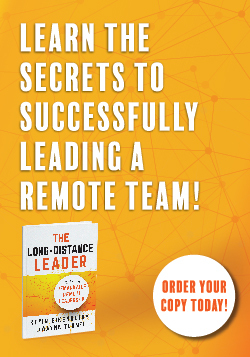 This isn’t just a leadership problem (some organizations are selling remote leadership training that is really just their normal training with the word “remote” attached). And it isn’t just a technology and tools challenge (though knowing how to use the tools can facilitate your success). The Remote Leadership Certificate Series brings together experts in both of these areas to help you get the results you want. The Remote Leadership Certificate Series is a small group experience delivered remotely just like you lead so that you get the experience, exposure and access to us that you need to be successful. It is 7 online sessions targeted for the skills a remote leader needs, including building a virtual team, leading virtual meetings, presenting effectively over the web, coaching from a distance and much more. You can expect to have direct interaction and feedback with both the instructor and other attendees – ensuring that all your questions are answered and that you make the most of your investment. Since we specifically limit class size to allow for maximum interaction and learning (you will be one of only ten people participating in the group) you will want to reserve your seat today – and you can do that by clicking on the button below to register. If you are a leader with people spread across geography and time zones, the skills you will learn in this series will change your leadership life. Join us now to have less stress and frustration, and greater confidence and success in your leadership role. Leading remotely is the new skill required for you to lead in organizations. Having some proof of your exposure to these critical ideas provides confidence and credibility for yourself and through your organization. If you are thinking of training multiple leaders in your organization, this certificate is a designation of their progress and an indicator of their future success. You can’t get all of these wide ranging skills in one session, and we are delivering it remotely because asking you to come to a face to face workshop to learn remote skills makes about as much sense as teaching you to swim in a gymnasium! Your whole learning experience is part of the learning itself! The Remote Leadership Certificate Series is designed to provide you with the practical skills to lead remote employees, virtual teams and mobilized work forces. The Series teaches techniques and methods to effectively motivate and manage virtual employees and teams with ease and success. What makes coaching and giving feedback different from a distance – and how you can do both more effectively no matter where you are! Whether you are just starting a remote project team or leading an ongoing group from a distance, this session takes traditional team development ideas and expands them and makes them relevant (and practical) for a group working virtually. The session includes a pre-class assessment of their current team health in three areas, copies of the course visuals and a PDF, re-printable packet of planning tools they can use for future presentations. Every leader we talk with, coach, or train tells us the same thing. They all have lots to do – more than they did six months or a year ago, with no end in sight. The reality is that we are busy. We have full plates. We are balancing home and work life. We have incredible demands on us every day, and everyone expects their project to be done NOW! We don't want to disappoint anyone—but something has to give. Without the traditional office environment, it can be difficult to separate and balance where work ends and home begins. Creating the right work environment at home can be difficult, particularly if you don't have a designated office space. And without the benefit of in-person "check-ins" or regular conversations throughout the day, projects and tasks often have unclear expectations. So while solid time and priority management skills are important for any employee's success, they're absolutely critical for the remote employee. In this session, we'll help you to get control of your day life and career. We start by identifying the unique challenges that confront remote workers, and robs them of both their productivity and time. You'll learn the importance of clarifying your role, your work and your goals and also how to make sure you and your organization are in sync right from the start. If you're tired of being overwhelmed; if you're falling further and further behind and sinking deeper into quicksand with no help in sight, you cannot miss this webinar, designed specifically to address the challenges that remote employees face every day. As a leader you know that helping your team member set goals - and then holding them accountable for those goals is part of your job. But more than that, it is critical to your success. Doing these things can be challenging in any setting, but when you are leading virtually, and not interacting or seeing your team members (and their work product) everyday, it is even more challenging. This session takes the principles of goal setting, supporting goal achievement and accountability and applies them to the unique challenges of doing it all at a distance. Over half a manager’s time is spent on meetings, and fewer than 20% of managers have received any coaching or training in the dynamics of effective online meeting leadership. It’s no wonder than that 60% of those meetings are considered wasted time by both participants and meeting leaders! In this session, we teach simple rules and best practices for leading meetings that get results. No matter the presentation platform, you’ll learn how to speed up adoption of the tool and gain a greater return on your technology investment. The session includes a pre-class assessment of your current online meeting effectiveness, copies of the course visuals and a PDF, re-printable packet of planning tools they can use for future presentations. If you lead a team or have responsibility for a project with people dispersed geographically, the challenges of giving feedback are heightened significantly. Not only are communication opportunities reduced, but in many cases it is harder to observe the behaviors you are coaching on. This session takes the principles of effective coaching and feedback and applies them to the unique challenges of doing it at a distance. This is a highly interactive session allowing participants to not only learn the principles and skills but get their specific questions answered. Participants will leave with the workshop handouts and checklists and tools to help them succeed in their coaching opportunities. Whether people work in the next office or halfway around the world, they deserve effective to progress in their productivity and results. This session will give participants the confidence and skills to do this successfully. The series concludes the way it begins – with you, Kevin and Wayne together to tie up the loose ends, solidify your knowledge, answer your questions and basically be your coach. You and your cohort of learners will have the chance to pick the brains of Wayne and Kevin, and they will share their latest thinking and lessons on all things related to leading remotely. If you or your organization want to bring this course on site to your organization - either as is or customized - contact us for more details. Continuing Education credits for SHRM (Society for Human Resource Management) and others. Check with your accrediting body.